Hello! Thank You! 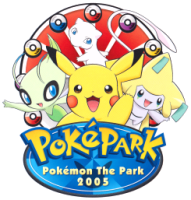 (ハロー！サンキュー！) is the theme song for the PokéPark amusement park that opened in Japan in 2005. It was later used as the ending theme to Pokemon Sunday and as an insert song in Pocket Monsters Diamond & Pearl. The song has no connection to the PokéPark games that came out for the Nintendo Wii. Used in episodes Pokemon Sunday 016 - 051, DP 055 "Aipom and Buoysel! Respective Roads!!" Kyou wa nani shiyou ka na? Egao? Nakigao? Dotchi na no? Hello! Thank you! HELLO! THANK　YOU! If you count how many times you say "I love it!" You can forget about bad things. A smiling face? A crying face? Which one is it?